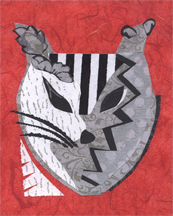 ©2012, Joan Desmond, Composition in Red. Collage. 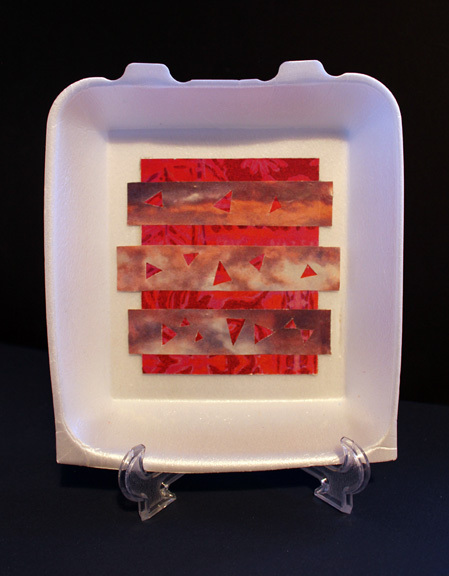 This art piece uses only two things: Styrofoam from a take-out container, and cut magazine paper. While the previously posted fish mobile is much about organic shapes, this one is about geometric ones, and numbers. Since these four works will be displayed at a school I kept in mind the various curriculum subjects. Art can be created in any class to enhance learning. The bull breaks the earth and kicks up the hidden stones. He charges around in a circle between the red and green. 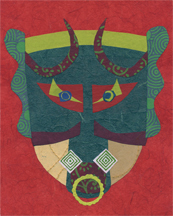 As the mask series developed the images became characters. Salt & Pepper is a composite of all the feral cats I’ve known, the independent ones that wander through periodically or stay awhile, sleep under the deck and let you feed them, but who always maintain a certain distance. Hadrian was the toughest one of that bunch. His character traits were on my mind as I worked on this. He lived in this canyon for at least eight years dodging coyotes, raccoons, bobcats and other predators. Once I saw him hold his ground and not flinch in the face of a barking, snapping dog, surely knowing that to turn and run would invite disaster. Yet he was capable of babysitting kittens on the lawn letting them pounce on him and chew his ears. He’d be gone for months at a time and then suddenly appeared again. He resisted most of my attempts to tame him, but as he aged he didn’t mind spending a snowy night in the garage in a blanketed box. Here’s to you Hadrian!